Now I just need the boat. 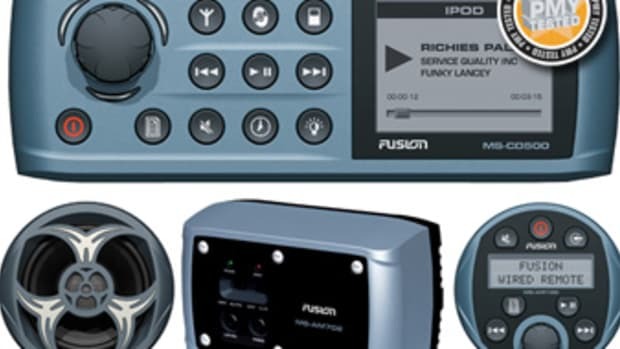 When I first wrote about the Fusion Marine Stereo system in my column last July, I not only saw a lot to like but had already half talked myself into an Apple iPod as the centerpiece of my next onboard audio entertainment system. A Touch model is sitting on my desk today, collecting content for future voyages, and the extensive Fusion installation—even more than shown above—is in my lab, a dummy install for sure but plenty sufficient for learning how the gear goes together and how it sounds. 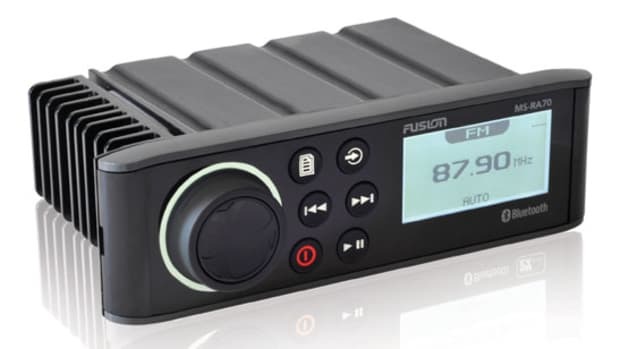 Apple and Fusion both bested my expectations, and I&apos;m sure the combination is tough enough to survive even my current little center console test boat, Gizmo. However, Gizmo is not worthy, if you get my drift. 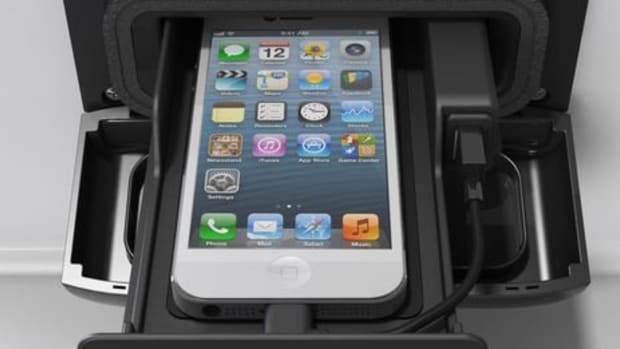 But let&apos;s skip my daydreams and the iPod Touch too, as an earful about that gorgeous gadget is all too easy to find. 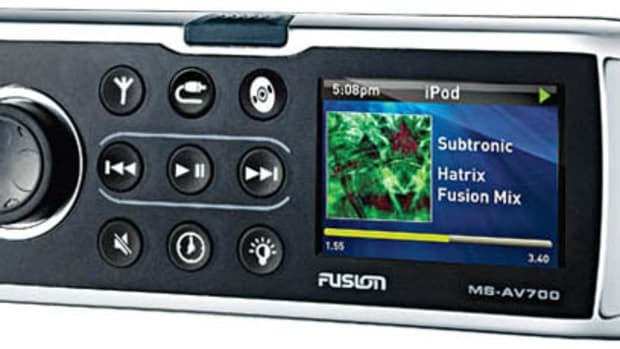 Let&apos;s discuss the more mysterious Fusion Electronics. 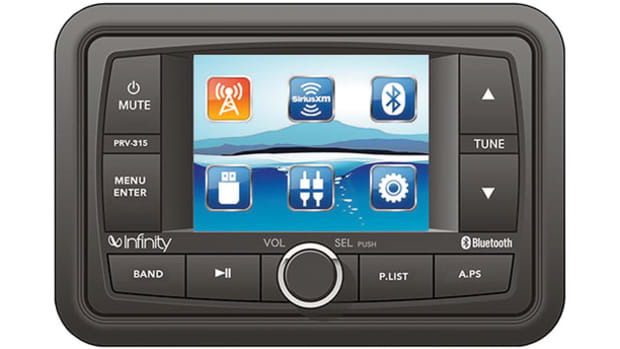 It&apos;s a small and young New Zealand company that started in car audio but quickly moved into marine. 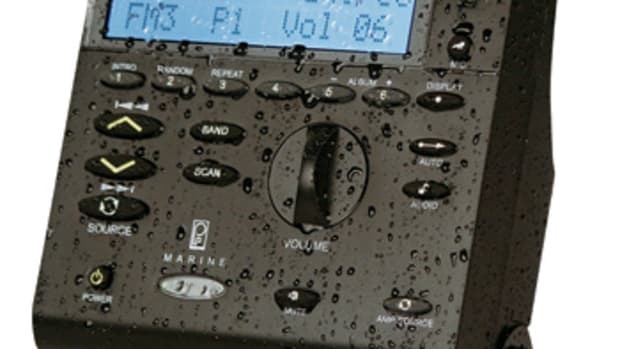 Two of its principals have extensive marine electronics experience—like cofounding Navman and leading Standard Horizon and Uniden—and I believe their claim that this "True Marine Series" was actually designed from the ground up. A major tipoff is the boaty look and feel of the MS-IP500 control head (not shown) at the center of my install. Those buttons are big enough, and separated enough, that even an old guy won&apos;t make mistakes in a seaway. Similarly, the 3.2-inch transflective screen reads fine in a wide variety of conditions, and the whole face is variably backlit for night cruising. Plus the single-function buttons, and even the menus of advanced features, are easy to learn, and should stay learned day to day—and probably season to season—even in an old brain. To me, the control head looks much more like serious marine electronics than what I usually see. I guess the typical profusion of multi-colored LEDs and multi-shaped controls looks "modern" to some, and normal in a car, but I find the style discordant around even a very modern helm. And the Fusion system is serious to its core. 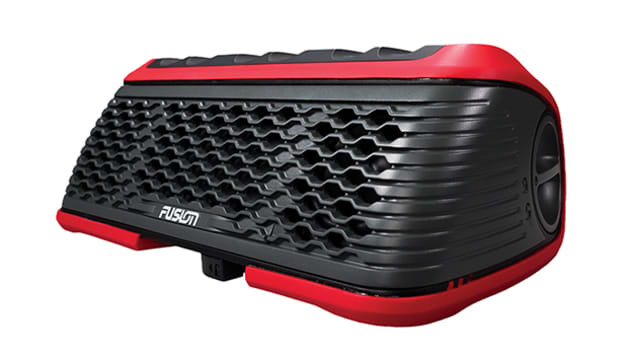 The MS-IP500&apos;s waterproofing is front and back and covered by a five-year extended warranty too, and its internal amplifiers are Class D standard, which means more sound with less power drain. The real kicker, though, is the zone system, which makes so much boat sense. 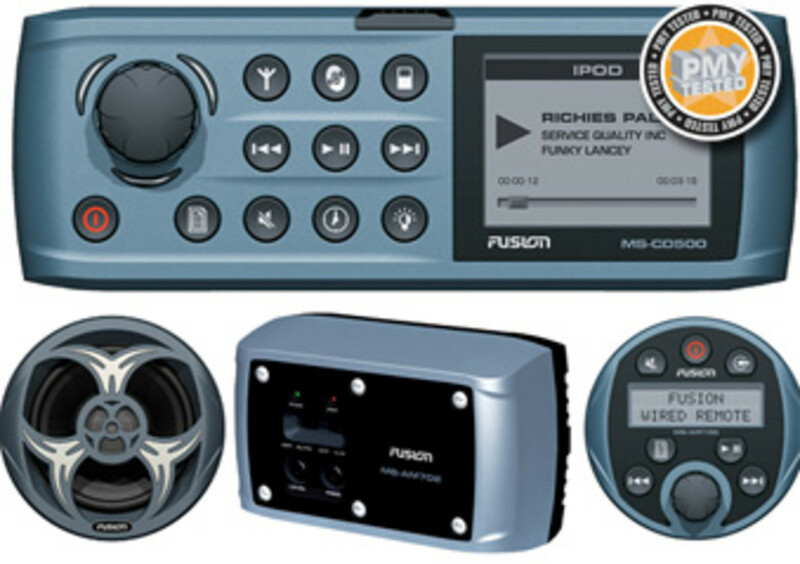 A $400 MS-IP500 can feed various sources—docked iPod, AM/FM tuner, Sirius Satellite Radio, or an auxiliary input like, say, a TV receiver (see following pages)—to as many as four zones around your boat. As many as four speakers each in zones one and two can be powered directly by the head&apos;s four 70-watt amps; zones three and four need their own amps, and so do subwoofers. 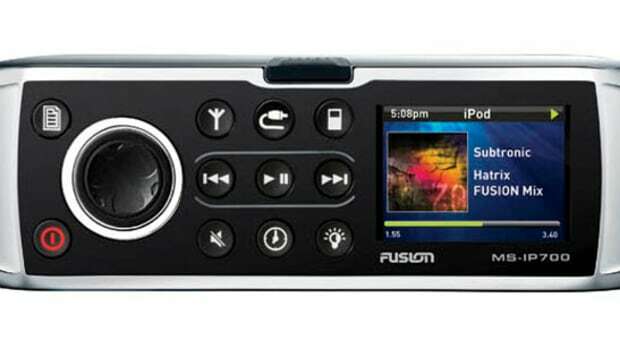 The main volume control suggests the possibilities. You can graphically manage the level of each zone individually or all of them together but with relative differences. 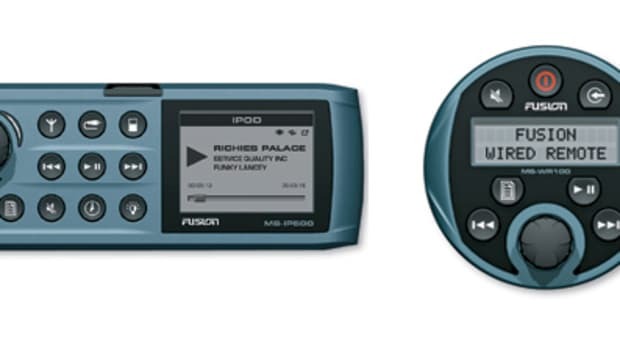 In other words, you can have tunes loud on the flying bridge but muted in the saloon and turn them both up a bit together or just one at a time.